CraftyCarolineCreates: Weekly Deals are Fab! 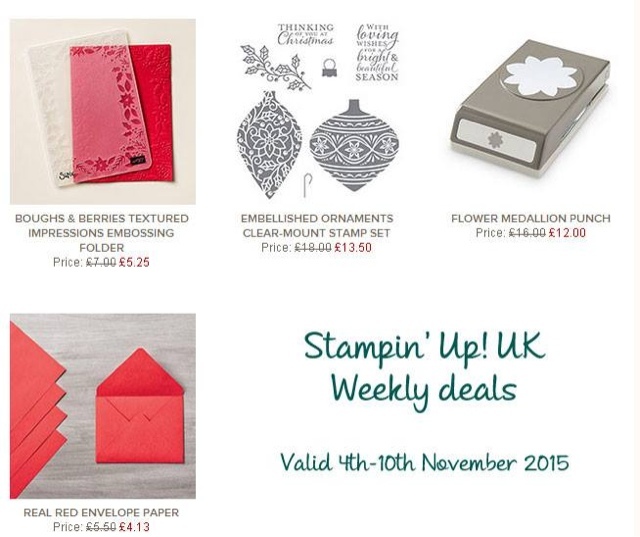 Just a super quick post from me today, I'm sitting at the airport waiting for a flight to Dublin for a meeting and I'm taking advantage of the free wifi to let you know just how fabulous the weekly deals from Stampin' Up are this week. The Flower Medallion Punch must be one of my favourite ever punches, it coordinates with two of my favourite stamp sets, Flurry of Wishes and Crazy About You. I also love how big a bargain the Embellished Ornaments Stamp Set is. This is such a lovely stamp set and if I didn't already have it, I know I wouldn't be able to resist at such a wonderful price. If you'd like to take advantage of any of the items in these deals, just click on the big Shop Now button to the right of my blog to go straight to my on-line store or you can drop me and email or give me a call and I would be delighted to place the order for you.